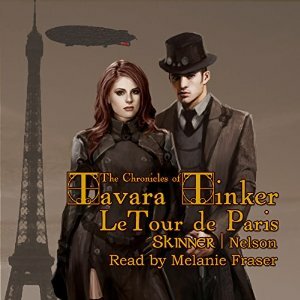 TAVARA TINKER—LE TOUR DE PARIS, Steampunk/Alternative Historical Fiction. Bob Nelson and Sharon Skinner are a dynamic co-writing duo. Tavara and her quirky band of intrepid heroes visit Paris on a quest to obtain a rare fabric for a client, only to discover they’re not the only ones with an interest in it. This first installment of the Chronicles of Tavara Tinker is a literary tour de force of drama, humor and excitement. This was my first foray into the steampunk genre and I enjoyed it immensely. Le Tour de Paris was an ideal title to start me off as it is a short read/listen. It had all the descriptions, details and paraphernalia that I would associate with steampunk. The story is action packed and the reader/listener is thrust into all the excitement right from the beginning. Because this is a short story, there isn't an abundance of information about the characters except for their looks and what they are wearing. The writers have, instead, concentrated on the series of action scenes which are very well written and entertaining. The narrator, Melanie Fraser, added a some extra pizazz with sound effects. I was surprised at how much detail and activity the writers were able to jam into such a short piece but they managed it superbly. I'm hoping that the current storyline continues into the next installment as I'm keen to find out what happens next. I'd also like to see the characters develop more as the series progresses so that I can gain more insight into their relationships with each other. However, the installments would need to get a little bit longer in order to facilitate this without sacrificing the action and adventure scenes. I loved the narration by Melanie Fraser. The narration is well paced and crystal clear. The little snippet of French she spoke was impressive and I found myself listening that extra bit carefully to see if I could remember my secondary school French. By the third listen I had it translated in my head, happy in the knowledge that the language is still rattling around in there somewhere. Le Tour de Paris is not a story that will bore you. I have listened to Le Tour de Paris three times to date and I enjoyed it even more each time. With so much going on in the story it is easy to miss a bit of the action if you get distracted so I found myself wanting to go back and listen to it again. If you want a short listen that is high in entertainment, I would definitely recommend Le Tour de Paris. For anyone, like me, who has yet to venture into the steampunk genre, Le Tour de Paris is a great place to start.